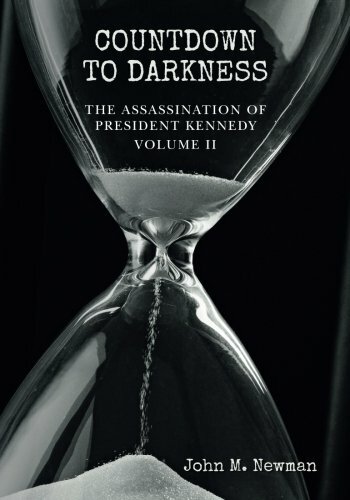 The second volume in a series on the assassination of President Kennedy, “Countdown to Darkness” describes events during a dangerous quickening of the Cold War. The race for a long-range delivery system for nuclear weapons came to its final, unexpected, and unstable conclusion—the “missile gap” favored the United States, not the Soviet Union. The European colonial empires were collapsing in Southeast Asia, the Middle East, and Africa, spawning Cold War hot spots, where Moscow and Washington rushed in to fill the void. The inevitable consequence of Castro’s revolution played itself out as communism established itself—armed to the teeth by the Soviet Bloc by early 1961—a few miles from the American underbelly. The book’s first chapter contains new revelations about how Lee Oswald was a witting false defector to the USSR in a CIA plan to surface a KGB mole in the CIA. This book reveals how deeply the Eisenhower Administration was in denial about the entrenched Castro police state, the complete penetration of all anti-Castro groups by Cuban intelligence, and the convulsive spectacle of the exiled Cuban leaders. As Eisenhower marshaled his subordinates to overthrow Castro, the president lost patience with DCI Allen Dulles. Eisenhower wanted a Cold War triple play—the elimination of Castro and, to ensure support from Europe and Latin America, the simultaneous elimination of Congolese Prime Minister Lumumba and Dominican Republic Dictator Trujillo. Dulles approved a CIA plan to use the Mafia to assassinate Fidel Castro in the fall of 1960, as the Democratic and Republican nominees entered the U.S. presidential election campaign. The Nixon-Kennedy debates turned into a spectacle over the crisis in Cuba. JFK pummeled Nixon for not standing up to Castro and not arming the rebels inside and outside of Cuba, while Nixon, who knew that was exactly what the administration was doing, was unable to respond due to the covert nature of the plan. In the NSC, the president had demanded, “Everyone must be prepared to swear that he has not heard of it.” Unfortunately for Vice President Nixon, Kennedy had heard all about it. By the fall of 1960, the principal Cuban exile groups in Miami, and their underground sections in Cuba, had long since descended into chaos. The principal CIA officer responsible for holding them together, Gerry Droller, was singularly incompetent. But that mattered little, as the rate at which Soviet Bloc weapons were pouring into Cuba rendered the exile leadership problem irrelevant. The exile government would never be put ashore in Cuba. All of this came together in a terrible ending. The covert CIA paramilitary plan was unable to keep pace with the consolidation of the regime in Havana, and that plan breathed its last before Kennedy was inaugurated. It did not take long for Allen Dulles and the Pentagon chiefs to figure out that if they told the president the truth about Cuba and Laos, he would abort in Cuba and negotiate over Laos. So they lied to President Kennedy about their views. They assumed that when the exile invasion force was being slaughtered on the beachhead, the president would change his mind and send in the marines and airplanes. The lie about Laos nearly worked. But when the lies about Cuba—that the brigade could succeed and the Cuban people would rise up in rebellion to assist it—did not work, the countdown to darkness came to its tragic, and ignominious end. Once past that foreboding event horizon, political and economic forces inexorably cleaved inward like matter pulled into the singularity of a black hole. Within a year, Kennedy would fire the top three men at the CIA and most of the Joint Chiefs of Staff.